Choosing the correct Automated External Defibrillator Machine for your business is incredibly simple with NDA First Aid Training Ltd. We offer a wide range of Automatic and Semi-Automatic AEDs to suit your business and your budget. Many of our Defibrillators come fully equipped with all the required extras and accessories, as well as voice guided instructions for administering a shock even without any formal training. Do not panic! You do not choose when to shock the casualty, the machine does! This high energy shock is called defibrillation, and it’s an essential life saving step in the chain of survival. If you have specific requirements, or not sure which one you need, simply give us a call on 01494 958547 and one of our friendly, knowledgable customer service team will be happy to help. What defibrillator suits my needs? 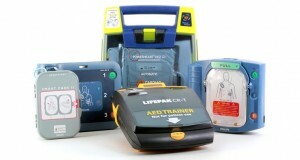 NDA First Aid Training Ltd independently resource and distribute a variety of defibrillators. We offer free and impartial advice on which defibrillator is for you, your company and your community. Please call us on 01494 958547 so we can assist further.